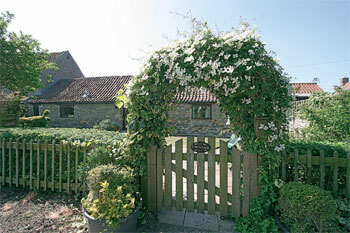 Kingfisher Cottage is a pretty stone cottage set in the countryside just 2 miles from Clevedon, North Somerset. The cottage has two bedrooms and sleeps up to 4 people. It adjoins the owners home and is adjacent to the Clevedon Crafts Centre. The cottage has bags of character with exposed stonework and vaulted beamed ceilings. As a bungalow it is all on one level and has a private enclosed garden with a quaint picket fence and gate. There is also a terrace which has been furnished with a patio table and chairs and a sun umbrella. There is also a barbeque. The living area is spacious with comfortable seating, a TV and DVD player. The kitchen is well equipped with a dishwasher and a washer/dryer. The bedrooms consist of a double and twin room and they share a large bathroom with bath and separate shower cubicle. The owners allow pets in this cottage (1 dog max).